Thread: First Post! 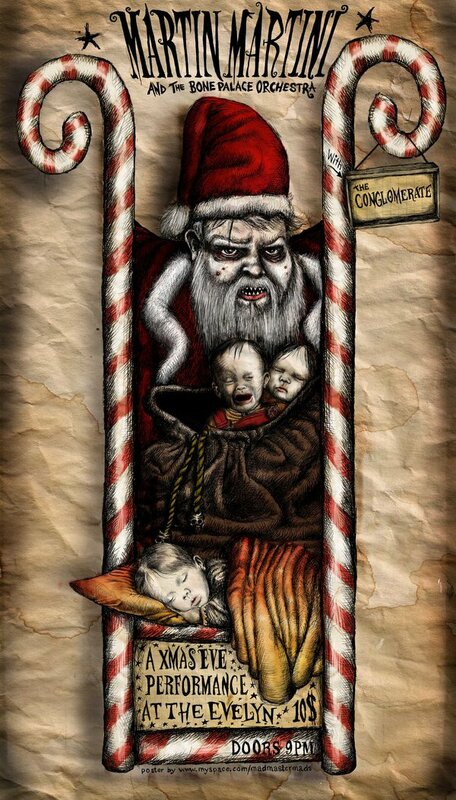 Scary X-mas poster! There is almost no end to the posibilitys! Will post more stuff soon! Ha ha ha thanks Jack ! I get kind of feed up with christmas and all the rednosed santas. This is the way santa get´s his workers. Ha snatches them when they are dreaming and then it´s off to the toymines! Seen your stuff here for a while! nice paintings ! What kind of music to Martin Martini and the Pale Bone Palace Orchestra play? Do I really want to know?... :? i likey. it kinda reminds me of a tim burton picture, but unique. cool stuff, im enRaged, nice to meet you. "Think Baz Luhrmann meets Tim Burton, think the Cat Empire with manic depression." So you were right on the money there enRaged ! I tried to get that feeling! And thanks Leo! Nice to meet you to. And thanks for making me feel welcomed! Ps! my englisch is really bad, that why i´m often gonna sound like beavis and butthead. This is a truly awesome picture. I dig it. I seen some of your stuff aswell and i like it ! Wow this is realy cool Monsumata..... I like it, Brilliant! All times are GMT +13. The time now is 12:55 PM.